The American market missed out on the last generation Audi RS4, because wagons don’t sell here and because we can’t have nice things in general. It is probably safe to say that the next generation RS4 Avant will remain forbidden fruit, but Audi plans on bringing the RS4 sedan back to America for 2016. 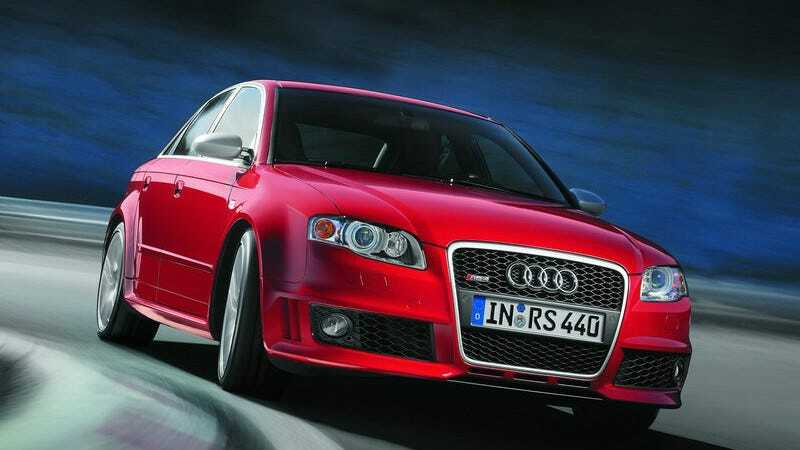 According to a report in Autocar, the next generation RS4 will be launched in both Avant (wagon) and sedan versions. A source from Audi said that market demand in the U.S and China has spurred the decision to offer multiple body styles for 2016. The last RS4 to hit our shores was the B7 sedan and cabrio back in 2007; it was a wonderful fender-flared, 420 hp monster. Low mileage examples are still commanding strong prices in the pre-owned market. As of now, there is no word on pricing or power figures for the new RS4. We do know that Audi is dropping the naturally aspirated 4.2 liter V8 in favor of a turbocharged 3.0 liter V6. It is likely the new motor should exceed the 444 horsepower rating of the current car in order to challenge the 425 hp M3, the 503 hp Mercedes C63 S, and the upcoming 510 hp Alfa Romeo Giulia Quadrifoglio. Bring it on, Audi. We’ll give it a good home.